All guitarists experience feelings of not progressing enough (or at all) at some point, some even struggle with this during their whole life. Frustrations and feeling like you're not learning enough on guitar can even cause guitarists to quit the instrument altogether, which is a terrible shame and a tragic loss. After reading this article you will have the tools to massively improve your blues guitar playing overnight. So let's start by giving your current practice routine a reality check. When you see master blues guitarists live or on videos, you see them performing their music with ease. What you don't see is how many hours of work they have put in before they are able to play like that. 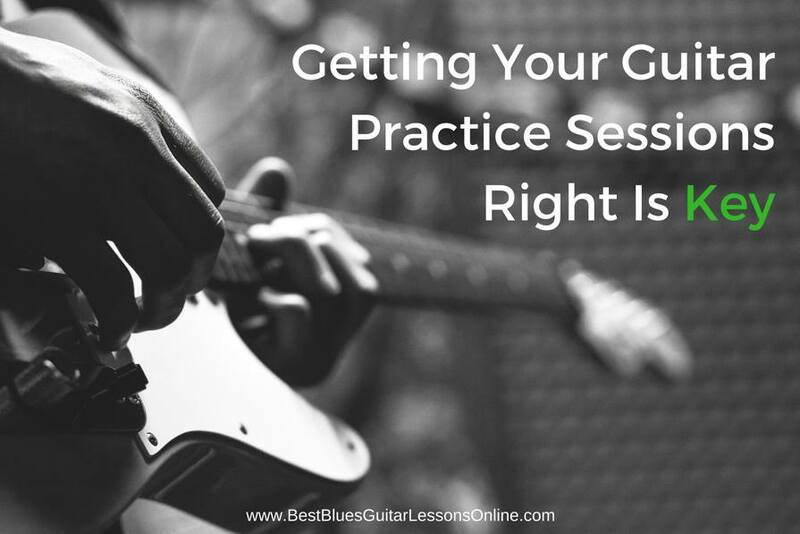 The need for a lot of practice to become great at guitar is probably old news for you. However it is the way you practice and handle the work you put into guitar playing which is crucial to actually improving the best way. - What technique/song/exercise do you want to be able to play? - At what tempo do you want to play a certain piece? - What kind of musician/guitarist do you want to be? Look back at your goals regularly and ask yourself: is the time that I spend playing the guitar truly devoted to reaching my goals? The 2nd step will help you in this. 2. Document your practice sessions to get an overview of your development. - Which subjects you are working on. - Which exercises you are practicing. - What material you practiced en when. - How long you effectively practiced a subject. - At what tempo you are able to play the songs. Keeping a notebook or journal is very effective. Also recording video or audio of your playing is an amazing help to really find out what your current level is or how you are improving. One very important thing you should always watch out for is the possibility that you are progressing but don't notice your own growth. You might be surprised of how much you have indeed improved if you listen back to recordings of yourself, from some time ago of course. If you are documenting your practice routine and its results show no real improvement in your playing you'll need to change something in your practice routine. Analyse the frequency and content of your practice sessions through your diary or journal. Ask yourself if you're handling too many different subjects without actually following everything through, also if the material you are studying really helps you reach your goals. Reality Check: Are You Really Practicing Or Are You Wasting Your Time? Practicing is what we need to do in order to be able to play without mistakes. It is when program our fingers, mind and ears. Our mind is a big part of the equation as opposed to just playing. You need to concentrate and to be very strict for yourself; every note should sound the way you want it to and should be played with the exact technique you intended on using. Play after you've already had a guitar workout. As a break/attempt to apply what you've studied. Your main intention or aim could be to make nice music. Practice in small bursts of several minutes and take breaks on time. if you practice too long at a time you'll lose concentration and the effort/time you spend will go to waste because it won't be taken in. Also mistakes will start creeping in your playing due to lack of focus. When you feel too tired or even too wound up to start a concentrated practice session; start with easy exercises or the shortest version of your planned exercise or song. Only practicing without just playing is too abstract and gives the feeling of not really achieving anything, so it can be demotivating in the long run. Needless to say that without practice (in the advised way) you won't make progress, you'll be stuck on the same level. This is also demotivating in the long run because you'll never reach your full potential. If you think you are spending plenty of time with your instrument but not improving you should check if there is a healthy balance between just playing (noodling) and concentrated focused practicing. Being strict with yourself is necessary during practice time but it takes effort and concentration. As we said earlier; to keep this up in the right way for a longer time is very hard and staying concentrated over long chunks of time is simply not realistic. So it is important to divide your time in small parts with breaks in between. When you've planned one hour of your time for guitar it is better to practice in short bursts of 5 -15 minutes that, together, add up to one hour. This goes hand in hand with dividing what to practice up in little steps. Take your what you want to able to play and strip it down completely. Add one small difficulty back in at a time and take your time with it. Only add the next part or next difficulty when you can play the previous perfectly. "Have control over using different scales and different kinds of sounds in my blues improvisations." How will I move towards this goal: "So I need to practice the scale thoroughly, I'll do this through certain licks. In the article about the altered scale you'll find a lick, this is what I'll be using as an example." "I first break the lick down to get it in my system as fast as possible. First I separate the rhythm and the pitches, I want to know where I have to put your fingers first, I'll add the rhythm later. Also I take the notes one part at a time; I practice the first bar and second bar separately, with this lick it is nice to practice the notes on each string separately. I make sure to get the pitches or notes right and then just repeat and play around with them to get them in my fingers." If the rhythm is tricky and you're having a hard time putting the rhythm and pitches together; also practice the rhythm separately (apply the rhythm to one string or one note or by clapping/singing/hit muted strings). I increase the tempo if I can play the bar a few times in a row without mistakes. I decrease the tempo when I start making mistakes and write down that tempo to keep an eye on my progress. When frustrations or feelings of inadequacy get the best of you, analyse your practice routine and your goals as described in the beginning of this article. See if you're truly spending enough time in the right way to becoming better as a guitarist. Have patience in learning new material, don't do too much at once and build up you're exercises step by step. Give yourself time to internalize what you're working on. Be very strict with yourself when you practice but remember to do it very focused for short periods of time. Repeat what you practice regularly. Remember to keep a balance between practice and letting everything go and just play from time to time, also to apply what you are learning. If you want to be able to grow to the next level in guitar soloing I strongly urge you to apply the material from this article to my free guide on How To Play More Advanced Blues Guitar Solos!